I think that many people find it daunting to start a new permaculture garden as it appears to be a lot of work, especially digging to prepare the space. However this need not be the case, as there are ways of starting your garden without any digging whatsoever. I certainly found this the most discouraging thing, especially as the surrounding area was overgrown with kikuyu grass and various other weeds. I was not interested in bringing in a small tractor to plough up everything and digging the place up with so much overgrown grass was more than I could think of managing. So after contemplating this problem for some while I hit on an idea which I thought was very novel because I had never heard of anyone doing it. I have subsequently heard that some people implement this method, but that’s it’s not as well known as it should be! What you need for this project though is empty cardboard boxes, which you can obtain from most supermarkets or bottle stores free of charge. Step One would be tramping down and if necessary cutting down the weeds that are protruding up too high. All your weeds can remain in the ground, but if they are too tall then it is preferable to cut them down in order for the cardboard boxes to lie flat. It is really best to tackle this task after it has rained, but if you have adequate water you can give it a good soaking before you start. 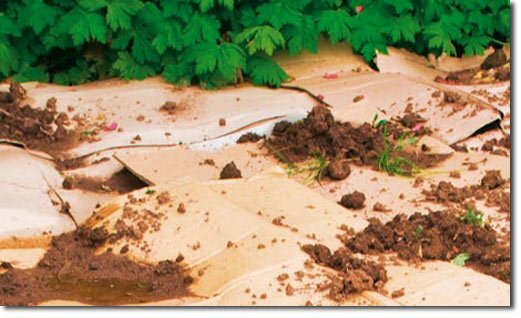 Step Two: The cardboard boxes get flattened and then placed on the area you want to garden, covering the entire surface as flat as possible. It is best to overlap your cardboard as some grasses and other plants are very persistent and tough and with the slightest bit of light they reach up a tendril to survive. However these single tendrils are much easier to get rid of later on than a whole area of grass. Step Three: I always water the cardboard so it is somewhat soft and therefore malleable and easier to keep down.